20% of U.S. Children have at least one untreated decayed tooth before kindergarten, according to the Centers for Disease Control (CDC)1. Untreated tooth decay (cavities) can lead to pain, weight loss, missed school days, poor appearance and decreased self-esteem. It’s critical children have strong, healthy teeth because their first set of teeth helps ensure their adult teeth come in correctly and are healthy. Also, it’s important they develop oral hygiene habits that they can carry with them throughout their adult life. How to manage your children’s oral care and how to prevent tooth decay is explained in this brief article. As soon as your child’s first tooth appears is when their baby teeth are at risk for tooth decay—typically between the ages of 6 months to 14 months. The good news is, tooth decay is completely preventable when the proper steps are taken to ensure your child’s oral health habits are routinely practiced on a daily basis. Within the first few days after your baby’s birth, begin wiping the gums with a clean, moist gauze pad or washcloth2. For children younger than 3 years, parents should begin to brush their children’s teeth as soon as their teeth come into the mouth—using fluoride toothpaste in an amount no more than the size of a grain of rice. You should also start flossing your child’s teeth when they have two teeth touching2. For children 3 to 6 years of age, brush teeth twice a day with a pea size amount of fluoride toothpaste. Make sure to supervise children brushing their teeth and advise them to not swallow the toothpaste2. Until your child can start brushing their teeth on their own, continue to brush their teeth twice a day with a child-size toothbrush in a peas size amount2. The ADA recommends your child’s first dentist visit should be before their first birthday. Not only does this first examine check your child’s mouth growth and development, but it also starts getting them comfortable with the clinical setting. Waiting for them to start school is highly discouraged due to the possibility of your child having tooth decay that goes untreated. Untreated tooth decay can cause pain and infections that may lead to problems with speaking, playing, and learning. Look for oral injuries, cavities or other problems2. If your child is at risk for developing tooth decay2. Clean tarter and plaque off your child’s teeth2. Provide tips for daily oral care2. Discuss pacifier use, teething, or finger/thumb-sucking habits2. Discuss treatment, if necessary, and make sure to schedule for the next checkup2. A morning appointment is recommended, due to children being more rested2. If you have any concerns or anxieties, try to not let your child pick up your emotional cues as they might start getting nervous2. Do not use a dental visit as a punishment or threat2. Do not bribe your child2. Speak with your child about what they should expect when they visit the dentist2. 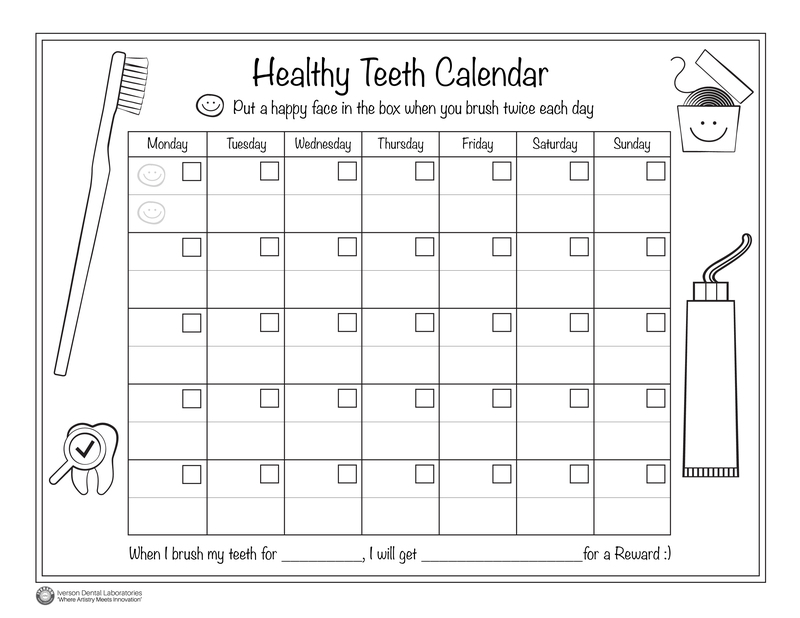 Download this Calendar to help your child stay on track with their oral health! For more great tips on your child’s oral care and fun videos for them to watch visit http://www.2min2x.org/kids-healthy-mouths/ by the American Dental Association. It is another great resource for you to utilize!